Remember that Genesis is a book about not only the beginning of the world but also the beginnings of God’s interaction with that world. It is a patchwork of traditions that is begin retold in light of a specific context and how the image of God is seen through that context. This story is one of the best-known and one of the hardest to understand. In fact, taken at face value, it is disconcerting, disenchanting, and downright shocking. But we need to understand the context from which this story probably came. While it was probably from a pre-Israelite setting, suggesting that it originated from within the circle and intimacy of a family, the story was handed down for generations upon generations before it was even written down. But think about those who lived during the time of the exile hearing this story. What they heard in this story was a God who put them to the test, called them forth from their continuing faith, and delivered them with renewed promises. What they saw was their own life and, in it, a God who provides. Because, you see, during the exile, it would have been very easy to assume that God was no longer available. They had lost everything that they knew. Where was God? But this story says, “here is God!…the God of new possibilities and renewed life.” From that standpoint, it is an important story in that tradition. The Hebrew term for it is Aqedah, “the binding”. The Arabic term for it is Dhabih. Arabic? You see, this story is also in the writings of Islam. But in that case, the story is often told of the Binding of Ishmael, Abraham’s other son, rather than Isaac. So, the whole point is that it is a story set in the context of the whole story of Abraham. And, it is apparently important enough to be told in multiple traditions. The narrator states that God “tested” Abraham. If Abraham were to carry out God’s instructions to sacrifice his son, then the promises that God gave would be nullified. The heir upon whom the future depended would be gone. 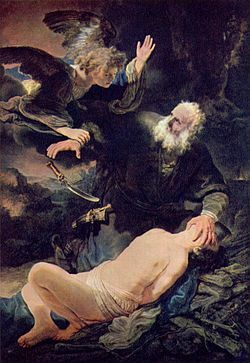 Abraham obeyed—binding the boy and raising the knife. And just at the right moment, God stops him. God provides. Now, we need to realize that this is not merely a story of filicide or, even worse, a God gone wrong. Sacrifices were a normal part of that society. In fact, human sacrifices of the firstborn were not only acceptable, but an honored tradition. So, for its first hearers, this story makes all the sense in the world. And then, God steps in and stops it—against all odds, against all culture, against the norm. But does just looking at this as evidence that God provides sort of oversimplify it? I mean, it appears to be the point. After all, Abraham makes this pretty explicit at the end by naming the place of this encounter “The Lord will provide.” But is that the only point? Throughout the Scriptures, there is a rhythm of calling, responding, and testing. Why the test? There are two words for test in Hebrew. One denotes testing to see whether or not standards are being maintained, much like our tests in schools. The other is used for experimenting–pushing an entity beyond its present limits to see how much it can bear. We might compare this to a chemical test where you combine elements into something else. A person who undergoes a test like this might succeed or fail. That’s not really the point. But one thing is certain—he or she emerges changed, either shattered or risen to new heights. Either way, one will not be the same as before. This is the word for testing that is used in this Scripture. Testing, here, has nothing to do with right or wrong. It has to do with Lech- lecha, the Hebrew for “to go”, “to move”, as in to a different place in one’s life. The test, you see, had little to do with whether or not Abraham would sacrifice Isaac, but, rather, whether or not he had moved to the point where he could truly trust God. I don’t think God deliberately creates difficult circumstances in our lives. And God has never implied that we have to earn God’s love or get it right for it to happen. Contrary to the way many interpret this story, God does not call us to blind obedience. God simply calls us to grow into who we are called to be. But I think many of us spend our lives as if we’re preparing for a test. We try very hard to learn right from wrong, to know the right answers, to prove that we’re right, and to do the correct things. And we miss the opportunities God gives us for lech-lecha, to move beyond where we are into the place we are meant to be. What meaning does this passage provide for you? What do you think this says about Abraham? Does Abraham obey because he is told to do so or because he trusts God? What is the difference? What do you think this says about Isaac? What do you think about the whole concept of the “test”? The first couple of verses provide a bridge from the previous verses to what follows. It sounds like a logic argument: IF the reign of sin has been broken in Christ, and IF the Christian truly live in Christ, THEN sin has no business continuing to rule. In other words, if one is in Christ, sin is not an issue. Remember that the emphasis of Romans has much to do with God’s righteousness. Here, God’s righteousness is revealed apart from the law. It is instead justified by faith. Beginning in verse 15, Paul lays out a choice between two obediences, between two loyalties—a slave to Christ or a slave to the world. The difference is in the slavemasters—one perpetuates slavery, one initiates freedom. The Greek word for “slave” is doulos. It can mean “slave”; it can also mean “servant”, perhaps the distinction between enslavement and service. The point is that we have changed masters—from sin to obedience to God. Obedience here is not, as we often assume, merely following rules. God is much more nuanced than that, I supposed! Obedience is not following rules; it is living within God’s will, God’s vision of what we are created to be. Obedience is the freedom to become who you are. This is true liberation. This is transformation. And yet, we still allow ourselves to become enslaved—to things, to security, to nice houses and nice cars, to too many clothes and too many pairs of shoes (Really, can you ever have too many shoes? No, I’m [sort of] just kidding!!!) The point is, we have sacrificed the freedom that God gives us not to just what we want, not to fall into step with everyone else, but to truly listen and follow God’s will for our lives. What does “freedom” mean for you in this passage? (Think about this concept of “freedom” as it relates to the Genesis passage. What “freedom” did Abraham have? Or, for that matter, Isaac? Or, for that matter, God? How does the whole idea of “competing slaveries” set for you? How does this idea of transformation speak to the idea that “God accepts us as we are”? This is a conclusion of a speech that authorizes and empowers the disciples as representatives of Christ. There is an implicit claim that Christ represents God and this passage, then, deals not with specific “12” disciples, but with the nature of discipleship. The whole idea of persecution is inherently unfamiliar to us in our society. After all, for good or bad, many see us as a “Christian nation”. (I use the term loosely.) But in this context, they WERE, on some level, being persecuted for their beliefs. Keep in mind that in the writer of Matthew’s Gospel’s theology, God is the faithful creator and redeemer of all of Creation. Creation and eschatology are not alternatives, but complement the God who embraces all. These rules, which for us seem rigorous and unforgiving, were set out to distinguish true missioners from what we would call “entrepreneurs”, who were set out to make money for their preaching and their good works. It is a matter of discerning true disciples from the false prophets of the day. For us, it’s a matter of living as true disciples, not holding anything back, and only giving God the time and the part of ourselves that we can spare. I don’t think Jesus was “anti-family”, so to speak. I think I would assume that loving and caring for our relatives and having a good relationship with them was the expectation. But, it’s back to the Genesis passage. Was God trying to make Abraham realize that even those relationships do not come “before God”? The truth is that they are God’s wonderful gift to us and part of our relationship with God. They are part of who we are called to be—not to idolize or put ahead of who we are before God but to take it into us and figure out what it is about that person or persons that God is using for our lives. Next week my 22-year-old son, Matthew, and I are going on a mission trip to Casa Esperanza, a children’s dental clinic and medical center in Puerto Lempira on the Mosquito Coast of eastern Honduras. Getting there involves three plane flights, a cab ride, and a bus trip. Reading through the “Instructions for Volunteers,” handout, I learned about all kinds of details Jesus doesn’t go into in his “Instructions for Volunteers” in Matthew 10:5-15. Jesus doesn’t go into airport taxes, the expected tips for people who handle your luggage, safety, appropriate attire, passports (your passport can’t expire less than six months after you plan to leave Honduras), where and how to exchange money, immunizations, luggage weight limits, malaria pills, insurance, and liability forms. Jesus’ “Instructions for Volunteers” simply says “Go to the lost sheep of the House of Israel. Proclaim the good news that the kingdom of heaven has come near. Cure the sick, raise the dead, cleanse the lepers, cast out demons.” He just tells the Twelve where to go and what to do. My Honduran mission trip handout also includes a “what to pack for Honduras” list. It includes all kinds of items Jesus doesn’t mention in his packing list in Matthew 10:9-10: ear plugs, hat, motion sickness pills, flash light, small battery operated fan, rain poncho, water bottle, camera, water shoes, sunscreen with an SPF of 30 or above, mosquito repellent, antiseptic hand wipes, an extra pair of shoes in case one gets muddy, snack food, and several other items I won’t bore you with. But if you were going you’d want to know about them. I am very grateful for the detailed “what to pack” list for Honduras. But I can’t help but compare it to Jesus’ “what not to pack” list in Matthew 10:9-10. No money. No bag for the journey, no extra tunic or pair of sandals, not even a staff. I don’t know that I would want to go on a mission trip whose team leader was Jesus. I picture Jesus as the airline employee who, just as you are dragging your roller board onto the plane stops you and says, “I’m sorry you’re going to have to check that.” But what he really means is, “You’ll never see this roller board again. Now get on the plane.” Without the preventive medications and small comforts of daily life, I am afraid a Jesus-led mission team would all come back home sunburned, dehydrated, and with blisters on our feet. I promise to . . . Lift up Jesus Christ with my thoughts, words, and actions. Maintain a servant attitude toward the people our team serve and toward team members. Refrain from negativism and complaining. Travel and ministry in Honduras may present unexpected and even undesired circumstances. Your cooperation and flexibility will make the challenges less stressful. Remember that I am a servant of Jesus Christ called to be in ministry. I will serve as best I can so that both the spiritual purpose and the task of the mission will be accomplished. At the bottom of the “Mission Trip Participant Pledge” is a place for me to sign and date the document. Wouldn’t those four promises be good to make every day of discipleship wherever in the world we are? Because even armed with a battery-operated fan, a bag of Planters salted peanuts, and some antiseptic hand wipes, we will experience “unexpected and even undesired circumstances” in our journey with Jesus. When we do, can we count on others to welcome and receive us? Can they count on us to welcome and receive them? I saw an interview with actor Michael Douglas recently on Oprah. He spoke of his relationship with his father, Hollywood legend Kirk Douglas, and told the following story. Wouldn’t it be wonderful if certain aspects of our lives and ways of relating to others were all but indistinguishable from Jesus? If they reminded others of Jesus, just a little bit? We seek, every day, in every place, on this mission trip of life, to be emissaries of Jesus: representatives of Jesus who welcome others as if they were Jesus and who relate to others in the spirit of Jesus? Who is the representative of Jesus? New Testament scholar Craig Keener, reflecting on 10:39-39 in relation to 10:40-42, concludes that “The one who relinquishes control of his or her own life (10:38-39) becomes a representative of Jesus.” (Keener, 211) Easier said than done, but we do so with confidence in our leader and the goal that, when we encounter others on our trip, we’ll welcome the Christ in them and they’ll welcome the Christ they see in us. But first we have to get off the website and get on the plane. We have to get off the shore and into the boat. (From “Mission Trip Guidelines from Jesus”, by Alyce McKenzie, available at http://www.patheos.com/Resources/Additional-Resources/Mission-Trip-Guidelines-from-Jesus-Alyce-McKenzie-06-20-2011, accessed 22 June 2011). How do you view this considering that fact that their being persecuted for their beliefs was a normal occurrence. What does this say about the idea of “true missioners” as opposed to “entrepreneurs” of our faith? What images of righteousness and following the will of God does this bring about for you? That there is a planet circling the sun, which we call earth, our first, wonderful home. Give thanks to the Lord who is good, whose mercies last forever. That the earth is full of loving gifts, beautiful scenes, and complex creatures. That from earliest days God spoke to people and called them into faith and service. That God’s people are called to be friends of the earth and stewards of its bounty. That God came uniquely to us in Christ Jesus, bearing our sins and healing our diseases. That we belong to a community called the church, where Christ lives on in love. That no evil can finally win out against God, and that complete reconciliation is assured. That through Christ’s ministry even death has lost its sting and the grave its victory. That we are surrounded by a crowd of heavenly friends, whose lives are hid with Christ.